For the past four months I have been using three of the Grey Logo shaving soaps from Deluxe Shaving Co., Mods, Rockers, and "The one with the skull on the label". At first, I used them for two weeks straight, then at least once per week since then. I will be sharing my thoughts and opinions on these soaps, and welcome any and all comments. The mature exchange of opinions and ideas is the main reason why I enjoy shaving forums so much. So you can relate to my opinions and get a feeling for my personal tastes, I will provide a short background of my shaving preferences. I have been shaving for almost 30 years, most of those wet shaving. I enjoy a wide variety of scents, but often favor woods, spice, and fruit notes. Over those years I have tried at least 100 shaving soaps and creams. Currently some of my favorite shaving soap manufacturers include: Saponificio Varesino, Razorock, Barrister and Mann, Tcheon Fung Sing, Martin de Candre, Soapy Bathman, and Dr. Jon's. Hopefully that information will give you an idea of my tastes and preferences so you can decide if yours would relate to mine. Currently, we as wet shavers are being overwhelmed with choices. There are so many fantastic companies producing a high standard of products compared to years past. However, after growing up in Canada, I always take notice when new companies based there enter the shaving business. Deluxe Shaving Co grabbed my attention on a shaving forum before they even started selling products. Their own website is easy on the eye, and simple to navigate which is always a plus in my opinion. The owner of Deluxe Shaving Co, Anthony, is friendly, engaging, and eager to answer any questions about his products. I'm always impressed by this industry, the people involved in it have been the most supportive and outgoing of any hobby I have taken an interest in. I figured Deluxe Shaving Co was going to be a little different than the norm with their first release of products. What grabbed my attention with their Green Logo tallow shaving creams was the Blue Moon scent featuring Blue Tansy, Orange Blossom, Rose, and Marjoram. I'll get to that at a future date, but it really got me thinking about their products. 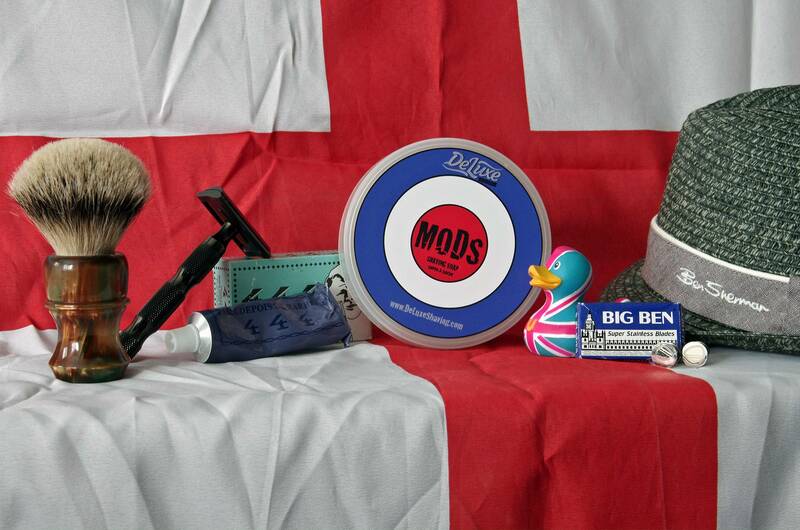 The Grey Logo soaps were released with a theme of Mods VS Rockers. It was a subculture for young people in Great Britain in the 60's and 70's, but started with the "ton-up boys" of the 50's and paved the way into the punk era later on. I had just watched a few documentaries on British motorcycles, European scooter, and the cultures surrounding them before the soaps were released. Needless to say, when the soaps arrived I went out to my garage to give my 100cc 2-stroke scooter a few good revs! Unfortunately, shortly after the release of "The one with the skull on the label", Deluxe Shaving Co was contacted by a copyright holder and asked to stop using the name they had chosen for their soap. I am sure that situation will be resolved and a new name will appear soon for that soap. My package arrived from Deluxe Shaving Co with a business card and a short hand written note. I'm sure they won't be able to do that for all their orders, but again it is a sign of the friendly tone set by the shaving industry. The Grey Logo soaps comes in a clear plastic tub similar to those often used by modern shaving soap makers. They are filled about half way with 4oz/118ml of soft soap to allow for loading a brush on top of the soap in the tub. Where the Deluxe Shaving Co Grey Logo soaps initially stood out was the labels. First impressions mean a lot to some people, and these do not disappoint. The labels have obvious quality, and feel durable. The graphics are simple, but because of that they really "pop". I would say in the price range it is competing in, the packaging is top notch. The ingredients are clearly listed on the side of the tubs. These are tallow soft soaps, with simple ingredients, including some interesting ones like castor seed oil, shea butter, lanolin, and silk fibres. The ingredients are: stearic acid, tallow, coconut oil, water, potassium hydroxide, castor seed oil, shea butter, lanolin, fragrance, silk fibres. I like to assess a shaving soap's scent in the container, as I am working up the lather in my shaving bowl, and as I am passing a razor blade over it on my face before passing judgement on it. I find shaving soap scents blend and mature just like colognes and perfumes do over time on the skin. It may sound strange, but one thing I like to do is dab a little of the lather on the tip of my nose as I work the lather in my shaving bowl, I find it increases my enjoyment of the scents, and to me scents play a big part of the luxury of wet shaving. The scents of the three Grey Logo soaps I have are very different from each other. I will give my opinion of them in the order I perceive the strength of the scents. "The one with the skull on the label"
"The one with the skull on the label" seems to me to be the strongest scented of the three. It is not the strongest scented soap I have ever tried, but it fills the room with scent when it is lathered and presents stronger than many similarly priced shaving soaps. This is the scent description from the manufacturer's website: " We used the warm notes of incense, amber, vanilla and patchouli. Then added the floral notes of rose, jasmine and lilac lighten the scent. Finally the aromatic notes of blood orange and grapefruit were blended to provide a hint of sweetness." "The one with the skull on the label" is also my personal favorite of the three soaps. It has a well thought out combination of scents. I love amber and that grabs my nose straight away, followed by vanilla, a mixture of floral and herbs, then a slight hint of citrus. There is some patchouli in there too which I don't normally like, but it works well with the combination of other scents. Upon lathering "The one with the skull on the label" , the scents blend really well and they all even out. "Lovely Jubbley" as one of my favorite TV personalities used to say! I admit, sometimes I open the tub just to smell it as I walk into my bathroom. 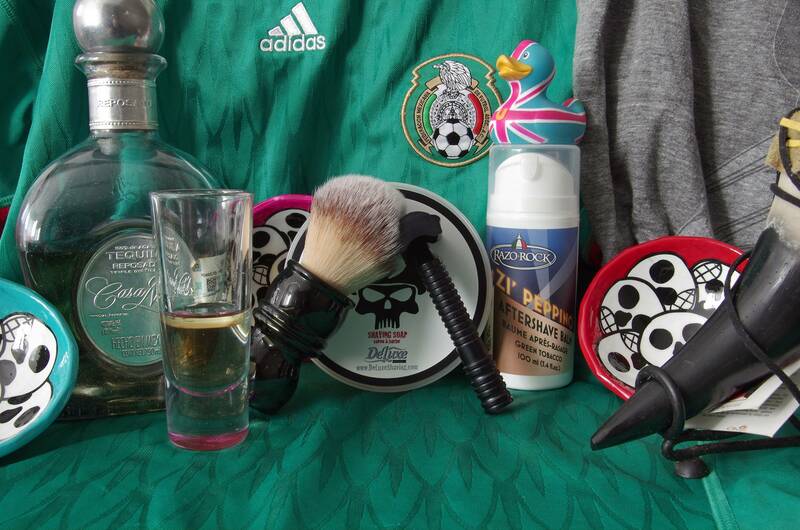 My favorite aftershave paring with "The one with the skull on the label" has so far been Razorock Zi' Peppino. The green tobacco scent pairs really well with "The one with the skull on the label". Rockers is also strongly scented compared to many. The scent description from the Deluxe Shaving Co. website is: "The scent contains notes of Raspberry, Lemon, Tanned Leather, Fresh Muddy Dirt, Moist Mossy Notes, Tahitian Vanilla and Tropical Flowers." My first impression of the Rockers scent was reminding me of the wonderful scent of the tropical Frangipani (also know as the Plumeria) flowers which grow close to my house. Unfortunately, it was quickly overpowered by a scent I could only describe as wet paper and ozone. I REALLY wanted to like this scent after reading it's description, but everybody has different interpretation of scents and this one wasn't for me. Interestingly, I had a good friend of mine sample all three of these scents from the tub, and he picked Rockers as his favorite. It just goes to show the old saying "your mileage may vary" really does apply. I find an aftershave that really pairs well with Rockers is the rich chypre Professional by Pecksniffs. Mods was mildly scented compared to Rockers and "The one with the skull on the label". 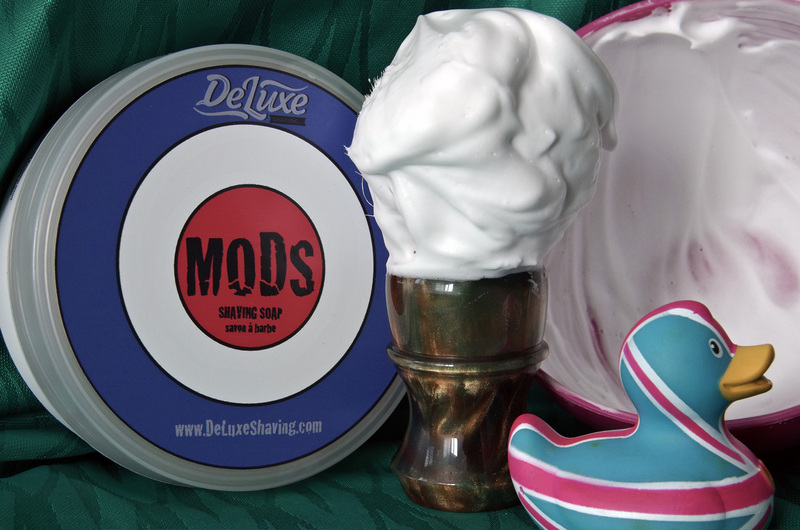 I believe Deluxe Shaving Co has two different scent strengths available for the Mods soap now, lightly scented and regular. I know many people who prefer a lightly scented shaving soap, and if you are one of those who likes a light cologne scent then this will make you very happy. The scent description of Mods is: " It is a refined and sophisticated scent containing notes of Bergamot, Mint, Lavender, Sandalwood, Jasmine, Cedar, Musk and Vanilla". In the tub I get musk, sandlewood and bergamot. While whipping up a lather of Mods soap, I found it blended together very nicely and I could definitely smell hints of cedar and very mild lavender on the tip of my nose (remember I am odd, and dab some of the lather on my nose as I work with it). I feel the scent of Mods would have the widest audience to appeal to. If you like the scent of Polo, or Polo Blue, you will like Mods. If you enjoy Eternity For Men, Hugo by Hugo Boss, Bulgari por Homme, or Opium por Homme by YSL then you will enjoy the Mods soap. I really enjoy using 444 aftershave gel with mods, the combination leaves my face feeling fantastic. These Grey Logo soaps would definitely be described as soft soaps, similar to the classic Italian soft soaps so loved by wet shavers. Many people would choose to load their favorite shaving brush in the tub, right on top of the soap similar to the "Marco" method, and these soaps would preform very well indeed that way. I am lucky enough to live a good part of the year in a climate where the temperature is above 30c most of the time, and above 40c for a couple of months. This makes loading a wet brush on top of a soft soap almost impossible as the soaps become even softer in this climate. To combat this, I scoop out a small almond sized portion of soap, and build lather with my brush in a small shaving bowl. One of the plus sides to this method I believe is a greater control over the lather (again, this is just my personal opinion). I came to enjoy bowl lathering, even though I find it takes much longer, as I find I get a greater appreciation of soap's scent as I work the lather in a bowl. Having shaved with the Deluxe Shaving Co's Grey Logo soaps for a couple of months now, I have experimented somewhat with the lather. At first, I was adding too much water which produced many small bubbles, and the lather broke down quickly once applied to my face. I found these soaps to require very little water, much less than many other soaps I have previously used. When the ratio of product to water is correct the results are rewarding. Working the few drops of water into the soap with a shaving brush, adding air by stirring, creates a thick lather which hangs like meringue off the bristles of the brush. As a side note, I used high quality badger, synthetic, and boar brushes with these soaps to great results, but had my best shave with the Mods soap, Semogue Owner's Club boar brush, and Razorock Black Mamba razor loaded with a Rapira Platinum Lux blade. Applying lather to my face before a first pass, I usually palm my brush like was recommended in old barber manuals. I find I get greater control of the brush this way and can really work the lather into the stubble. I like to leave the lather on the hair for at least a minute before starting the first pass so the ingredients in the soap can soften the hair and start to protect my skin. These Grey Logo soaps do a very good job, not only is the cushion and slickness up to standard, but I feel the soap did a good job protecting my face and not drying it out. For me, the measure of a soap's lather is on the second pass of a shave. After the first pass of a shave is completed, the razor blade has removed the bulk of the hair you desired it to from the face, and as a result your skin has endured many micro cuts and scrapes. For the second pass I usually switch my grip on the brush and apply lather with more of a paint brush like technique which I find applies less stress to the skin. I found the Grey Logo soap lather soothed my skin without creating irritation during the second pass of a shave, and started to moisturize as well. At the end of the second pass, I could still feel a protective film left behind by the lather. After a three or four pass shave, the Grey Logo soaps left my skin feeling protected and moisturized as I said before. I wondered if this was a result of some of the ingredients in the soap? Did the caster oil help, the shea butter, lanolin, or silk fibres maybe? I will leave that for people to debate. CONCLUSION - good addition to any shave den, what will they come up with next? From the excellently thought out themes, the fantastic labels and packaging, to the solid shaving performance, I would recommend these soaps. 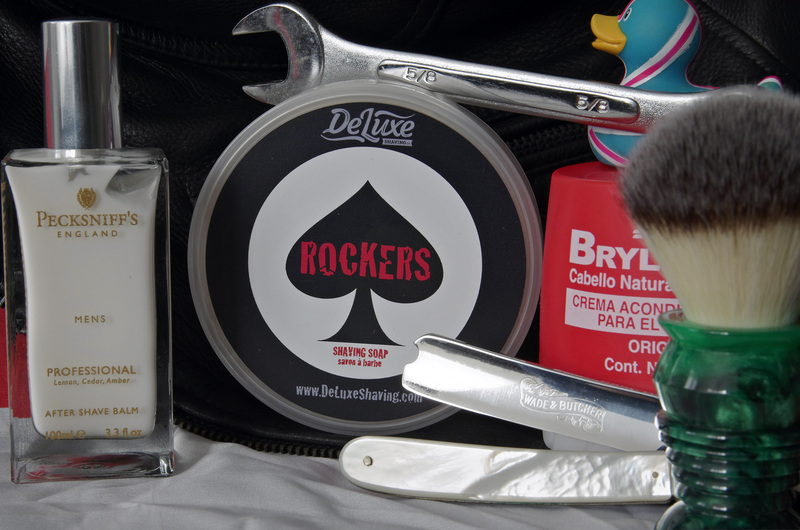 Experienced wet shavers, and those new to the hobby would welcome a tub in their shaving den. The scents reviewed were interesting, and my personal favorite "The one with the skull on the label" is something I would have no problem recommending everyone should try. However, I understand that Deluxe Shaving Co has recently added some additional scent profiles to their Grey Logo line; British Racing Green, Dolce Vita, Speedster and Espresso Amaretti are all new, and I am sure there would be at least one in there to please everyone. Who wouldn't want a soap called Speedster, or British Racing Green dedicated to heroes like James Hunt or Sir Stirling Moss? Fantastic review nffclsr, thanks for posting! I haven't yet tried the Deluxe Shaving Co soaps. They sound interesting! That is quite the review, very well written and laid out. I have also reviewed Deluxe Grey Logo soaps in particular 'the one with the skull on the front' and Rockers. I liked both but Rockers stood out to me. I love Raspberry and that is a main component of this one, although I would have liked it to be a little stronger. I can see where you are coming from with the wet paper smell, I think this is a mix of the dirt and leather, this bit may need toning down a little. I agree with you in the packaging and presentation, it is very good. I also like Anthony's marketing pictures, everything about these first soaps struck a cord with me and peeked my interest. Thanks again for the great review, like you I will look forward to what comes next..in fact the Coffee/almond sounds very good. Outstanding review !!!!! !DeLuxe soaps are top notch,the one with the skull is my favorite as well. British Racing Green and Lucky 13 (the skull one) are my favorites. Speedster is also very good for a 'cologne' type scent. Gr8t review. Now another bunch of soaps I gotta add to my ever growing acquisition list. Awesome review man! "The one with the skull on the label" sounds great to me!